Early hip implant failure has plagued numerous manufacturers, leading to mass litigation against companies like DePuy, Stryker Corporation, Zimmer and Wright Medical. While advancements in artificial prosthetics have promised better mobility and fewer risks of complications, emerging research suggests that newer hip replacement designs are no better than their older counterparts in terms of risk of revision surgery. The study, published in the British Medical Journal last month, found that some models may be even more prone to serious complications. The primary objective of the meta-analysis was to compare the survival rates of different implant combinations for total hip replacement. The research evaluated data from 15 separate studies on 3,177 hip replacements, looking at revision rates among more modern systems that feature metal-on-ceramic, ceramic-on-ceramic, metal-on-metal and other implant combinations. 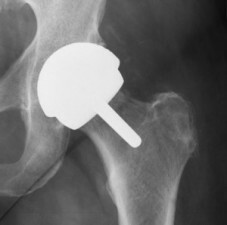 The outcomes of patients who received newer generation hip replacement systems were then contrasted to those implanted with an older reference model (a cemented metal-on-polyethylene, small head fixture implant), leading researchers to conclude that failure rates have not changed significantly. The implant variations were defined by bearing surface materials such as metal or ceramic, head size and fixation method (cemented, hybrid or uncemented). Results were determined by comparing revision surgery rates at less than two years post implantation and between 2-10 years after the surgery. The results are not especially promising for the more than 30,000 patients who undergo total hip replacement surgery in the U.S. every year. The dangers of premature implant failure are higher in metal-on-metal designs, which are more prone to adverse reactions to metal debris. Due to increased risks of metallosis and serious health complications associated with MoM implants, the FDA has cautioned that patients look out for signs or worsening symptoms suggestive of systemic reactions, blood metal poisoning and general implant failure. Localized pain, reduced mobility and inflammation can indicate the need for implant loosening and the need for revision surgery. Over the past years, allegations of defective design have fueled thousands of hip replacement lawsuits filed across the nation, with patients seeking legal recourse for their failed implants, medical bills, pain and suffering. Much of the litigation has been resolved through settlement negotiations, as was the case with the DePuy ASR settlement offered by Johnson & Johnson. More recent hip replacement injury lawsuits have centered around Stryker hip systems, after the company recalled a large-diameter femoral head (LFit V40) that was linked to high complication rates. The recalled component was used in various models including the Styker Citation, Accolade and Meridian.